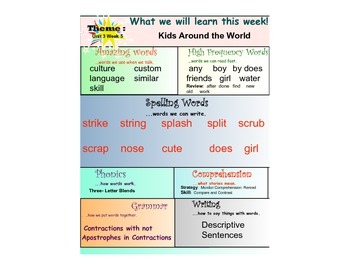 This is a weekly chart that outlines weekly skills that go along with Macmillan/McGraw-Hill Treasures Series - Grade 1. 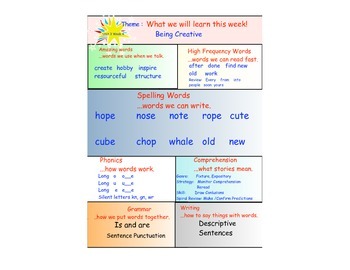 The skills on the chart include high frequency words, robust vocabulary, spelling words, phonics skills, comprehension skills, grammar and writing skills. 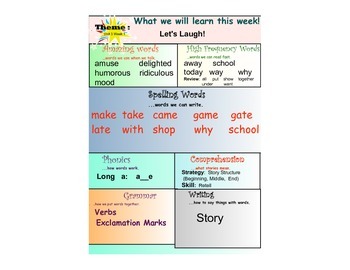 In my class, we review the weekly focus chart every day before we begin ELA. I also created a poster size chart to hang in the room for the kids to refer to throughout the day. 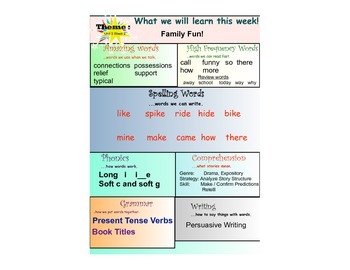 In addition to this, I also send a copy of the focus chart home so parents can help their child review the skills taught that week. The parents look out for this chart so they can help their child at home! It has also helped prepare the kids for the weekly skills tests because these skills are targeted each week on the test.